Are you about to start a new business? If so, you can do a lot to protect yourself and your family by forming a corporate entity. This corporate shield does just that: it shields your personal livelihood from creditors of your business should your business fall on tough times. There are several different corporate entities for which an individual may choose for his or her business (both a local attorney and accountant should be consulted in determining which entity to set up). Below are some very common questions and answers regarding the various types of corporate entities and when they are necessary and appropriate to protect the legal interests of both the company and owners. A corporation is a legal entity created upon filing Articles of Incorporation with the Department of the Secretory of State. It has a legal status or existence that is separate both from the individual(s) who forms it and its owners. What are the advantages and disadvantages of being incorporated? The Department cannot advise on matters such as this. Please contact an attorney or other adviser. However, one sure advantage of forming a corporation is that it can protect an individual’s personal assets, and may also protect against others using your business name. What is the difference between a limited partnership, a limited liability partnership, and a limited liability company? A limited partnership is a partnership with two kinds of partners: general partners and limited partners. The general partners manage the business and are subject to unlimited liability; that is, the general partners are personally liable for the debts and obligations of the partnership. Generally, limited partners are not permitted to participate in the management of the business and enjoy "limited liability;" that is, they are not personally liable for the debts and obligations of the company. Filing a certificate of limited partnership with the Secretary of State creates limited partnerships. A limited liability partnership, also called a registered limited liability partnership (RLLP) , is a kind of general partnership. RLLPs are frequently businesses that provide professional services, such as law firms. An RLLP does not have "limited partners," but a general partner is nevertheless NOT subject to personal liability for the malpractice of another partner unless he or she participates with or is responsible for supervising the partner committing the malpractice. A general partnership becomes a RLLP by filing an application for registration with the Secretary of State. A limited liability company has some of the characteristics of partnerships and some of the characteristics of corporations. It is not subject to "double taxation." The owners of an LLC are called members. LLCs are managed by the members or by managers who are not members. Members enjoy "limited liability." Filing articles of organization with the Secretary of State creates LLCs. 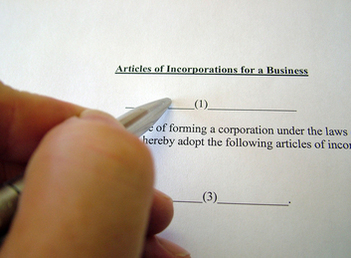 What is the difference between an LLC and a business corporation? A business corporation has officers or directors and pays an annual report fee of $20.00. An LLC has members or managers and pays an annual report fee of $200.00. An LLC is an unincorporated association that offers a combination of limited liability and special tax treatment. A business corporation is an artificial entity and offers limited liability that protects the personal property of its shareholders. How many people are required to organize a non-profit corporation? One or more people are required to organize a non-profit corporation. Two or more (1 limited partner and 1 general partner) are required to organize a limited partnership. One or more people are required to organize a Limited liability company. One or more people are required to organize a business corporation.